If you have dry skin, look for a hydrating cleanser with natural butters or glycerin, like L’Occitane’s Shea Cleansing Milk. Oily or acne-prone? Try products with salicylic acid, glycolic acid or benzoyl peroxide - I have yet to find anything better than Neutrogena’s Oil Free Acne Wash for this purpose. And if you have super-sensitive skin, wash with a gentle, fragrance- and dye-free cleanser and avoid acids, botanicals and too many preservatives. You won’t go wrong with Kiehl’s Rare Earth Deep Pore Daily Cleanser. Use different products for your face and body. Since body skin is thicker, those cleansers are tougher and contain detergents and chemicals that strip oils – a strict no-no for delicate facial skin. Take your time. Gently massage in the lather for 30 seconds, and then let the cleanser sit there for another 30 seconds, before rinsing thoroughly. The cleanser binds to the skin’s oil and debris, removing it while rinsing, and it needs more than a couple of seconds to achieve that. Avoid cleansing more than twice a day. Too-frequent washing can dry and irritate your skin or stimulate oil production, resulting in clogged pores and breakouts. If you need a midday pick-me-up, just rinse with water. If your skin still seems dull, try twice-weekly exfoliation and a deep cleansing mask. These remove trapped debris and dead cells, rejuvenating skin and allowing products to penetrate better. 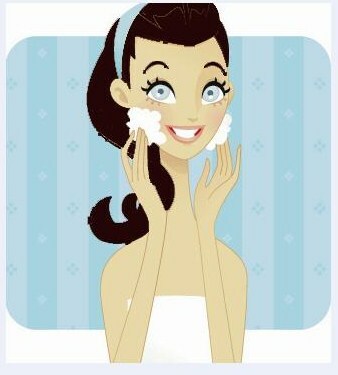 Stick to gentle scrubs, with micro-beads for fragile facial skin, and chunkier crystals for the body. Remember that it’s more important to wash at night, than in the morning – because of the dirt, oil, and makeup that your skin is subjected to all day long. There is no greater skin sin than going to bed with gunk on your face!